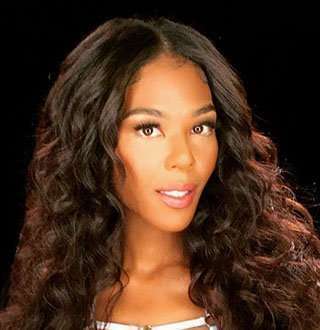 Reality TV star, Moniece Slaughter made her name in the music industry at the age of 31, and her step-father turned out to be a known celebrity. Moniece Slaughter is pretty known for appearing on the VH1 reality show, Love & Hip Hop: Hollywood alongside Erica Mena and Brooke Valentine. She is also known for singing the theme song Riches for America’s Next Top Model. She is quite active on social media sites with more than a million followers on Instagram and almost 200K followers on Twitter. Here are some captivating wikis on Moniece slaughter’s age, net worth, birthday, parents and life around the music industry. Born in 1987, Moniece Slaughter celebrates her birthday on 4 March. She was born into a family from a musical background with both her parents' big music fanatics, which is why she was bent towards a career in music from an early age. The TV star, aged 31 started her music career early. Music was something that she had to learn from the very beginning. She learned all kinds of genres and eventually began to like them. Not just that, she gained fame from her passion after singing the theme of one of the most popular shows, America’s Next Top Model. Not just that all her talent and hard work yielded fruits after her song was sung by biggest names in R&B, Marques Houston and the Lonely singer, Akon. Her significant rise to fame was when Moniece appeared as the main cast in the first season of Love & Hip Hop: Hollywood, where she was introduced as an aspiring singer and songwriter. As a songwriter who has written for famous singers and as the main cast of a top-rated tv reality show, Moniece Slaughter has amassed an enormous amount of wealth. An average singer earns $39,899 in an average per year. There’s no doubt that Moniece earns significantly more, acknowledging the fact that she has sung the theme song for America’s Next Top Model, along with collaborations she has done with R&B greats, Akon and Marques Houston. She’s also an Instagram model and earns from her modeling as well. All her earnings combined, Moniece probably boasts a net worth in seven figures. However, the exact figures of her net worth have remained confined. According to her wiki, Moniece's family also consists of a brother who is mentally ill. DJ Thomas suffers from hallucinations and delusions and has to take regular medications to stay sober. During a rare screen appearance together with her brother on The Dr. Phil Show in June 2018, DJ claimed to have produced entire albums for Drake and Beyonce. Not one to shy away from making outlandish claims he had previously stated about getting engaged to Rihanna, and also claimed about desires to share the stage with pop queen Beyonce. Not just that, her brother has a habit of going missing from the home, which has left his family fearing for his health. In October 2017, Moniece had to openly ask for help with social media community to locate the whereabouts of her brother, who had been missing for three weeks. And during pledging help to locate her brother, she and her mom also called out Brandy Norwood saying he was the man behind his frequent disappearances. In a statement, Moniece stated that Brandy encouraged her brother to get off his medications and even prompted him to begin the consumption of alcohol. The Instagram model has got a son named Kamron David Frederic from Rapper Lil Fizz. She loves her son and often posts about him keeping the fans updated on him from his first time learning swimming to his dental checkup. Her son is already eight years old now and isn’t precisely into music as his family. Moniece, who came out as bisexual in 2017 has a girlfriend who adores Kamron. Moniece introduced her girlfriend AD Diggs who runs a sneaker shop called Digg The Kicks soon after coming out. Moniece has also mentioned how hard it might be for her son to have torn parents, but his grandfather keeps him the best company. Now, that’s a surprise no one was waiting for. According to the wiki, Moniece’s step-father was a part of the infamous gospel group, TAKE 6. Apparently, Moniece’s mother has been married to Dave Thomas for a long time. Although Moniece is his step-daughter, Dave doesn’t fail to show her the affection a birth father would give any daughter. Moniece doesn’t seem to have any problem revealing proudly about her father on social media sites. She posted a picture with him on Instagram with a heartfelt caption expressing how thankful she was that he was there for her and her mother. The Outpost's Jessica Green Dating Moments With Boyfriend; Still Going Strong! Catherine Paiz Age, Real Name Revealed; Won't Marry Austin McBroom, Why? Marnie Simpson & Boyfriend Take Dating Up A Notch! Relationship Escalates, Family On Mind? Laura Vandervoort Nearly Married & Turned Boyfriend Into Husband, What Went Wrong?